I finally have a week off work and cannot wait to relax and enjoy the great food that Brighton has to offer. Having visited the Foodies Festival at the weekend it has reconfirmed how great local and freshly cooked produce can taste. The sun is shining and the air warm, is this t-shirt weather? I meet my old flat mate Dave for a good catch up and to grab a light bite to eat and enjoy a great coffee in the sun. 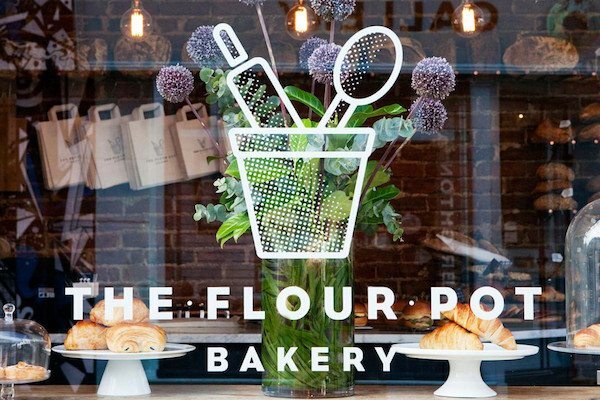 We have both heard lots of great things about the Flour Pot Bakery, with their flag ship store conveniently located on Sydney Street in the North Laine, a perfect spot to enjoy a day in the sun. The cafe is on the certainly on the right side of the street, perfectly placed to catch the early afternoon sun. As we walk into to the restaurant we are greeted by the staff and have a chat about the food available today. The cafe is simply decorated with the fun logo on the wall and neutral colours giving a feeling of relaxation. The copper lighting gives a wonderful contrast; the Flour Pot Bakery is very inviting. 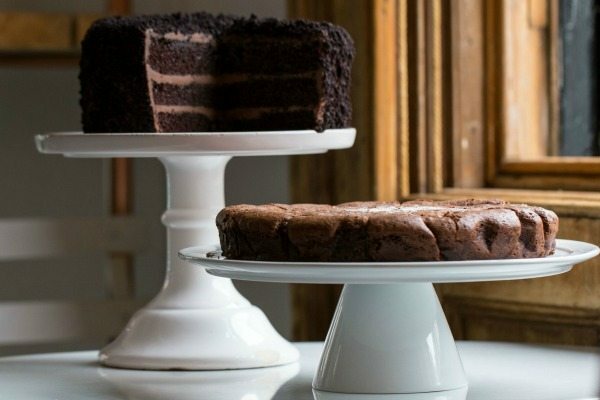 The wonderful thing about the Flour Pot Bakery is their story, starting out as a sought after local bakery making an array of artisan products. 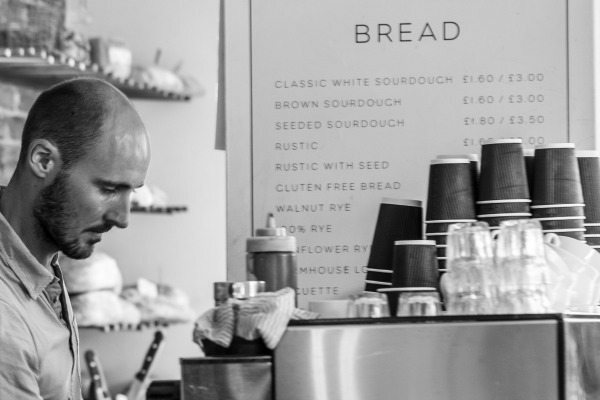 Having provided fantastic delights for the Small Batch Coffee Company they now deliver out as far as London, are running three stores in Brighton and the great thing is they are still working with Small Batch. It is fabulous to see local businesses working together to create exciting, new things. It is still early in the afternoon and I have come to enjoy a small bite to eat in the sun, the problem is the selection is so inviting, and the different types of sandwiches and treats are all so tempting. The sausage rolls look great and normally I would be dive straight on them but what stands out to me today is the big slice of focaccia, filled with layers of pastrami, gherkins, rocket leaves and a sweet yellow mustard sauce. 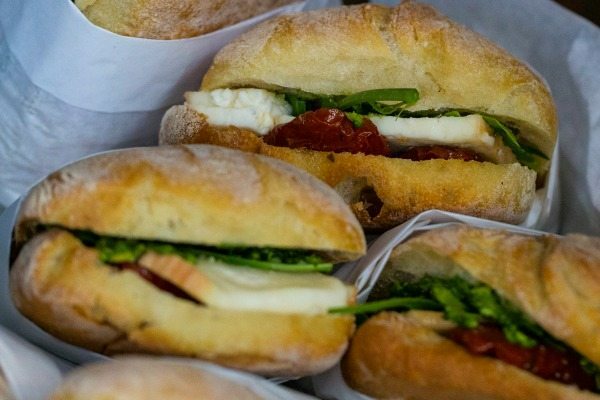 Dave is drawn to the Italian flavours of the ciabatta filled with sundried tomatoes, mozzarella and pesto. 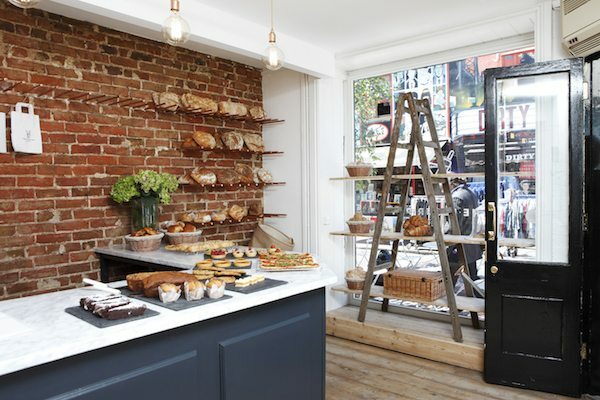 Both look great and though slightly jealous, I cannot wait to get stuck in and try this bread that is making the Flour Pot Bakery so iconic in the North Laine. We grab our sandwiches and head out to our table in the sunshine, as we sit the waiter offers us cold water and places our coffees down in front of us. We have both opted for black coffee, a great test for the taste and lazy day pick-me-up. They have done Small Batch proud as the waft of roasted coffee waves over us, it is perfect. 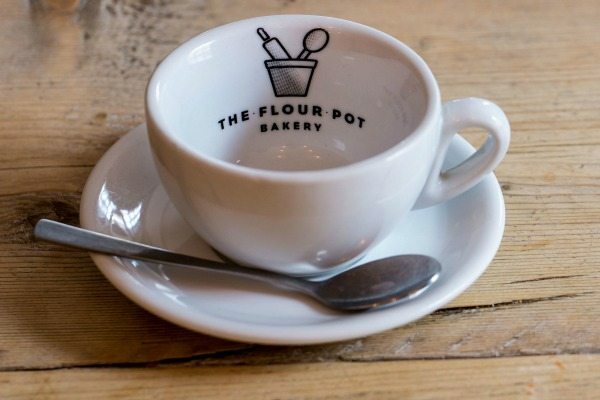 Served in quirky Flour Pot Bakery cups, another reason this establishment stands out, with simple yet comforting ease. 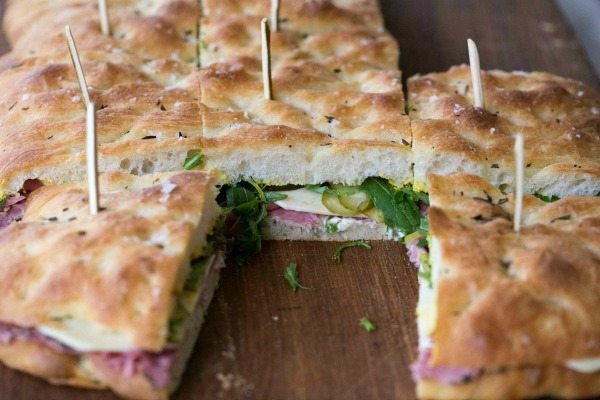 I grab my sandwich and take the first bite, the focaccia is soft and light, a sign we have expert bakers onboard and a far cry away from the heavy attempts seen elsewhere. The pastrami crumbles as it should, lightly spiced on the outside and of top quality. Add the peppery rocket and sweet mustard sauce and you have punch of flavour. The crunch of the pickled gherkins take the sandwich to the next level. I am a big sandwich fan and this is superb, one New Yorkers would be proud of! As I take a second rather large bite I look across at Dave, who is already half way through and thoroughly enjoying his ciabatta, I sheepishly ask to try a bite. I feel guilty asking as I know that Dave cannot have a bite of mine being a vegetarian but being the great friend he is he politely and begrudgingly hands me the ciabatta. Again the bread is perfect, it has the firmer texture you want from your ciabatta which the nice crust to the outside. 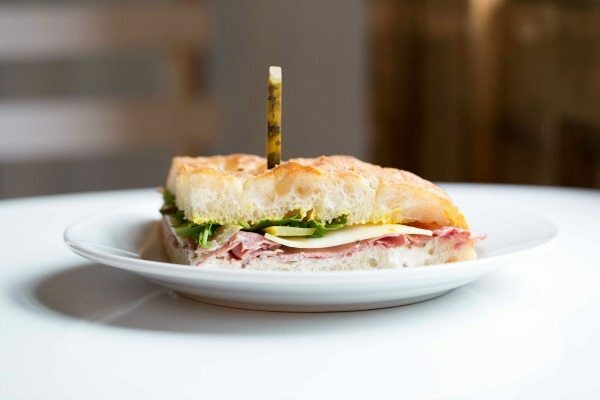 The sun-dried tomatoes and mozzarella are a winning combination, the addition of the pesto gives a vibrancy to the sandwich that is close to rivalling mine. The Flour Pot Bakery use great produce and make everything with care, it shows in abundance with a simply sandwich like this. There is no place to hide if something is not quite right, but of course, like their bread, they have nailed it. I can’t believe I’ve not been here before, not only is the Flour Pot Bakery a lovely sun trap but actually a wonderful local cafe that you will come back to during wind, rain or snow. The staff are friendly (without trying too hard) and have a great knowledge of all of their produce. The managers are fantastic and everyone seems proud to work there. They of course serve a wonderful choice of goodies to go with the great coffee and not just the sandwiches, they have homemade cakes and cookies as well. On my next visit I know I will be trying one of their sausage rolls. I also have it on great authority that the chicken and chorizo melt is to die for, and am praying that they are serving the same three layered chocolate cake that I wish I had the space for now. The Flour Pot Bakery is wonderful story of hard work, great skill and fantastic service. They are a local business to be proud of and one the many reasons that make Brighton a great place to live. If the Laines is not easy for you to get to or you want to avoid the weekend crowds, head to the stores at Fiveways or Elm Grove and you will not be disappointed.